Liu Xia, wife of jailed Nobel Peace Prize winner and Chinese dissident Liu Xiaobo, holds a portrait of him during his funeral in Shenyang in northeastern China's Liaoning Province, July 15, 2017. Late Chinese Nobel laureate Liu Xiaobo’s supporters abroad and at home have vowed to exert the maximum amount of pressure on China to free his widow, Liu Xia, whose whereabouts remain a mystery a week after her husband’s death. “If they [China] don’t let Liu Xia go, where I’m going to be campaigning for relentlessly is for every country on earth, every democracy, to rename the streets of all Chinese embassies into Liu Xiaobo Plaza,” said Jared Genser, a U.S. lawyer who represents the couple. That will provide physical locations for supporters worldwide to remember Liu while serving as a public shaming of the Chinese government, which the lawyer said has spared no effort to erase the existence of Liu Xiaobo from the Internet and inside China. Genser added that he’s working with officials at the highest levels in the U.S. government, which may join many other governments, including France, UK and Germany, to seek to engage with China publicly and privately regarding the matter. The lawyer called on world leaders to hold Chinese authorities accountable for mistreating the country’s most famous rights defender and placing his wife under unlawful incarceration. Liu Xia, a 56-year-old poet, painter and photographer, has been under continual police guard and house arrest since 2010 after her husband was given the Nobel title. She has been diagnosed with depression and heart conditions while being disheartened by the passing of her beloved parents and husband, one by one, over the past two years. According to the Hong Kong-based Information Center for Human Rights & Democracy, Liu Xia and her younger brother Liu Hui were still out of reach as of Friday afternoon. With no signs of her return, her apartment in Beijing remains heavily guarded by secret police, the group added, citing Liu’s relatives. One day earlier, when supporters worldwide paid tribute to Liu Xiaobo on the seventh day after his death, Liu Xia was said by the group to be held by police on “forced vacation” in the southwestern province of Yunnan. According to a Chinese belief, a person’s soul is said to return home seven days after his death to bid farewell to his loved ones. ​She last appeared in a video clip, released by Shenyang authorities, in which she seemed to openly agree to have Liu’s body cremated and ashes scattered at sea during a sea burial on Saturday — two days after the 61-year-old Liu died of terminal liver cancer in state custody. But many of Liu’s supporters are unconvinced. “I firmly believe the funeral arrangements were against the will of Liu’s family because his widow apparently was forced to record the video clip and appeared to be was reciting from a note,” Ma Shaofang, one of the 21 student leaders wanted after the 1989 Tiananmen protests. He made the allegation in a prerecorded video prior to a secret Wednesday memorial service he attended in Beijing, along with 30 intellectuals who once endorsed Liu’s Charter 08 — a political manifesto calling for political reforms in China. Hu Jia, a rights activist and friend of Liu and his family, agreed. 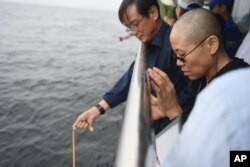 He said the authorities’ attempt to dismiss Liu’s legacy by scattering his ashes into the ocean has backfired. Supporters worldwide now find it easy to commemorate the late democracy activist anywhere near the water. Hu expressed grave concern over Liu Xia’s well-being, as she has had a history of emotional meltdowns. He said he’s afraid she may take her own life following Liu’s death. It would be ideal for her to eventually leave China, he said, although many observers believe Beijing would be reluctant to let her do so because she could become a figurehead of resistance. “Authorities are concerned that Liu Xiaobo may have left behind dying words or a final political statement, which may be passed on by Liu Xia to the local Chinese society or the international community,” Hu said. So far, international rights groups, the Norwegian Nobel committee and the U.N. all have spoken up for Liu Xia. The U.N. High Commissioner for Human Rights pledged to discuss the matter with Chinese officials to "ensure that she has freedom of movement and that if she wants to leave China, she should be able to leave China."